Lit City Blues: This Week In Vexillology #217: Flag Day Special! It's Flag Day and you know what that means? Time for our salute to state flags to continue. We're dipping back into the Lost Archives a bit to put together a trifecta of flags that were lost in the mists of cyberspace. First up, we've got Tennessee! 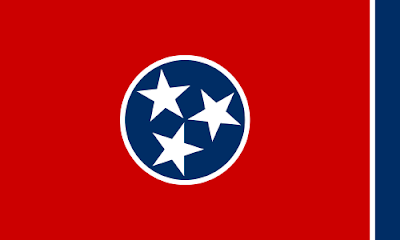 Adopted on April 17th, 1905 and designed by Colonel LeRoy Reeves, the flag of Tennessee really isn't all that bad when you look at it. It's not a 'Seal On A Bedsheet', it avoids the cardinal sign of being too busy and too cluttered and it is blessedly free of any obvious Confederate symbolism that seems to haunt the flags of the South. 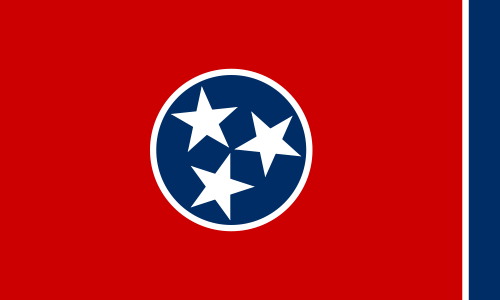 NAVA's 2001 survey ranks Tennessee 14th out of 72 flags they surveyed, which seems about right to me. It's not as iconic as Arizona, Texas, Colorado or New Mexico (the big four that always spring to minds) but it's solid, it's recognizable and it's kind of cool, to be honest. The three stars in the center of the flag represent the three Grand Divisions of the state and the circle around them represents the unity of the three. The blue stripe at the edge of the flag was actually just a design consideration to keep too much red when it's hanging limp. Adopted on May 9th, 1902 and designed by John Eisenmann, there's an official salute to the flag ("I salute the flag of the state of Ohio and pledge to the Buckeye State respect and loyalty") and a specific seventeen step procedure to fold the flag. The three red and two white stripes stand for the roads and waterways of the state. The blue triangle stands for the hills and valleys. 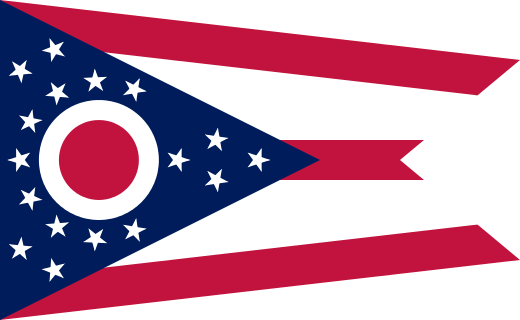 There are seventeen stars in the blue field- the thirteen grouped around the 'O' represent the original thirteen colonies, while the four at the apex of the triangle bring the total to 17, because Ohio was the 17th state admitted to the union. We must be doing mid-majors for Flag Day this year, because's NAVA's survey ranks Hawaii 11th out of 72 surveyed which I feel is both kind of harsh and kind of get at the same time. For one, the Union Jack in the canton is sort of unoriginal from a design perspective. It does stand out in terms of state flags, but in the grand scheme of things sort of not so much. Adopted on December 29th, 1845, the eight stripes on the flag stand for the eight major islands in Hawaii. The origin story of the flag itself varies a little, but King Kamehameha I was presented with a Red British Ensign given to him by Captain George Vancouver as a token of friendship with King George the III. After seeing it flown in various places, advisers suggested to the King that perhaps he should lower it avoid being seen as an ally of the British in any international conflicts. Similarly, during the War of 1812, an American flag was raised to placate American interests but was lowered again when British officer objected to it. 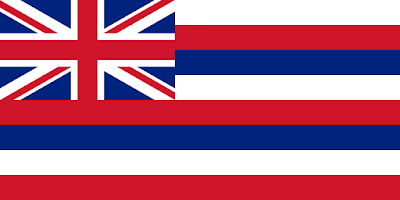 Balanced between both American and British interests at the time, the story (if true) goes a long way to explaining how Hawaii ended up with such a hybrid of the two nation's flags. All in all though, I think it's pretty cool. There you have it! Our Flag Day Special! #TWIV will be back July 1st with a Special Canada Day Edition and then be back in it's usual time slot on Saturdays for the rest of July!